unfolds in a captivating manner and stimulates feelings of anger, anguish, sadness, sympathy, joy, relief, etc., allowing the reader to identify with the state of mind which affected Nabi Sallallahu Alaihi Wasallam and the household of his best friend, Abu Bakr Radhi Allahu Anhu. 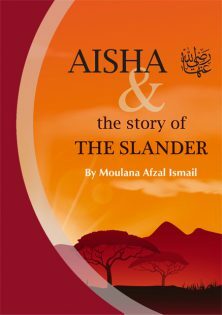 Aisha’s Radhi Allahu Anha story combines many of the teachings mentioned at various points in the Qur’an and ahadith regarding hijab, slander, backbiting, chastity, social etiquette, respect, etc. It also provides a contextual perspective for the laws of slander as enshrined in the Qur’an. This incident is extremely relevant in today’s times when deteriorating morals, materialism and unbridled technology have caused modern man to forget the basic rules governing social interaction.